Your neighbor's dog, Buddy, falls out after only 10 minutes of playing catch with the kids. Your dog, on the other hand, considers 10 minutes of play a mere warm-up. That's because your dog is an athlete. He's used to jumping over bars, chasing discs, running after balls, and keeping up with you while you pound the pavement. In fact, he's even the kind of athlete that would put Rocky Balboa to shame. That's why as his owner, you need to make sure he eats the best food available to fuel his active body. More calories, not less, are his friends. But these calories need to come from the right kinds of food to ensure constant peak performance in your pup. Before we get into what nutritional essentials your dogs need, we need to define what an "athletic" dog really is. If you canine runs around the backyard for about 30 minutes a day, we're not really talking about him in this article. An athletic dog typically spends approximately two hours a day doing dog activities like the ones described above. Therefore, he needs a high-energy diet to refuel. The two essential elements to this type of diet are fat and protein. If you make your pooch's meals from scratch, they need to include 15 to 25 percent fat and 30 to 40 percent protein. For those who barely make their own meals, when you stroll down any grocery or pet supermarket aisle, look for brands that contain 10 to 18 percent fat and 24 to 28 percent protein. Whether your cook or buy their food, you can increase the fat levels by adding fat from animal sources (saturated fats) or fat from plant sources (polyunsaturated fats). Animal provides your dog with the highest levels of energy while plant fats like those found in vegetable oils are the reason his coat and skin sparkle. 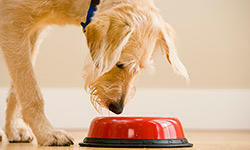 Before you go changing the diet of your active dog, make sure he really does need the meal adjustment. He'll let you know if he isn't getting enough to eat. If he appears lethargic and has less energy than usual, that's one sure way to tell. Also, watch and see if he's wolfing down his meals faster than normal. He's probably not getting enough food. So what do you add to their diets? Some pups will just need more of what they are already eating and won't need to be switched to a higher-energy diet. Another alternative is to add some fatty meat like hamburger, steak, lamb and pork to your dog's meal. If he still acts like he cannot get enough to eat, then it's time to consider a higher- energy diet. Dogs that are "super-active", i.e. those who are into sledding, herding, skijoring and military and police work, will definitely need more high-octane foods added to their meals just to keep up with the pace of their active bodies. Examples of these types of food include meat drippings from roasted beef, chicken and turkey. Some dog owners like to buy poultry fat from their local butcher because it's very easy for the dog to digest. Just remember: it's not healthy for dogs to just eat these high-octane foods alone. They need to be combined with their regular meals.